The Dynamic Host Configuration Protocol (DHCP) server role in Windows Server 2012 introduced a new policy based IP address assignment feature. Policy based assignment (PBA) allows an administrator to group DHCP clients by specific attributes based on fields contained in the DHCP client request packet. This feature allows for targeted administration and greater control of configuration parameters delivered to network devices. This guide provides step-by-step instructions for deploying DHCP policy based assignment in a test lab using one server computer and two client computers. Software and hardware requirements are provided, as well as an overview of DHCP policy based assignment. Multiple device types: A network includes many different DHCP client devices, such as printers, IP phones, and desktops. Administrators need the ability to classify these devices using different IP address ranges. This enables router policies and quality of service (QoS) based on IP address range policies to control network access or traffic. For example, you can add a vendor class of “Hewlett-Packard JetDirect” or Cisco Systems, Inc. IP Phone CP-7940G and configure printer and IP-phone policies to assign a specific IP address range to these devices. Virtualization: A data center network employs virtualization for different workloads and applications. Virtual machines are added and removed dynamically depending upon load requirements at a given time. An administrator wishing to route traffic on the network differently for VMs can create a policy based on MAC address prefix to assign a short lease duration, specific IP address range, and different default gateway. 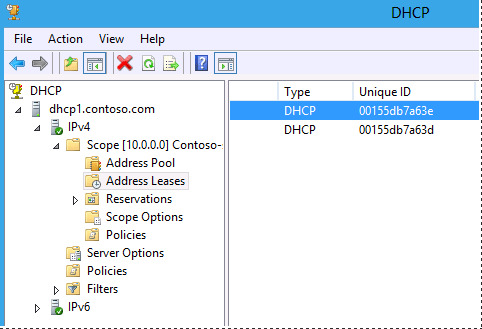 The following fields in the DHCP client request are available when defining policies. Policy settings can be of three types. IP address range: The IP address range within a scope from which to assign an IP address to a client. A server level policy cannot have a setting for an IP address range. Standard DHCP options: One or more standard DHCP options to send to a client in the response based on the options requested by the client in the parameter request list. Vendor specific DHCP options: One or more vendor specific DHCP options to send to the client based on the vendor class field in the client request. The DHCP server evaluates policies sequentially according to an assigned processing order. The DHCP administrator assigns the processing order to the policies. If policies exist at the server and scope levels, the server applies both sets of policies and evaluates the scope policies before the server policies. The processing order for a scope level policy defines the order of evaluation within the scope. If there are no policies defined at the scope level, the policies at the server level apply to the scope. The DHCP server determines the scope to which a DHCP client belongs based on the gateway IP address of the relay agent or the interface of the DHCP server on which it receives the DHCP client packet. Once the server determines the client scope, the server evaluates the DHCP packet against the policies applicable for the scope in the processing order specified. The policies applicable at a scope are those configured at the scope and those inherited from the server. A single client request can match multiple policies. If a client request matches the conditions of a policy for which a specific IP address range is associated, the server will assign the first free IP address from the range as determined by the rule. If a policy is associated with multiple address ranges, the server will assign IP addresses by first attempting to assign an IP from the lowest address range. If no IP addresses are available to use from the lower address range, the server will then look for a free IP address from the higher address ranges. If no IP addresses are free from any of the address ranges associated with the policy, the server will process the next matched policy as defined by the processing order. If none of the matched policies has a free IP address, the server will drop the client packet and log an event. If a DHCP client packet does not match any of the policies applicable for the scope, or none of the matched policies for a client packet is associated with an IP address range, the server will lease the client an IP address from the IP address range configured for the scope exclusive of any policy-specific IP address ranges. A DHCP client uses the parameter request list field in a DHCP packet to request a list of standard options from the server. The option assignment processing for a client is similar to that of IP address assignment. The DHCP server evaluates the fields in the client request against each policy applicable for the scope in the processing order specified. If the client request matches the conditions of any of the policies applicable for the scope, and its settings include specific options, the server returns these options to the client. If multiple policies match the client request, the server returns the sum of the options specified for each of the matched policies. The DHCP server sends vendor class options to the client based on the vendor class contained in the DHCP client request. This test lab demonstrates new DHCP functionality in Windows Server 2012 or Windows Server 2012 R2. One server computer and two client computers are used. See the following figure. One server computer and two client computers are required to complete the test lab. The product disc or other installation media for Windows Server 2012 or Windows Server 2012 R2. One computer that meets the minimum hardware requirements for Windows Server 2012 or Windows Server 2012 R2. At least one DHCP client computer is required. The lab uses two computers running Windows® 8. If only one client computer is available, or clients are not running Windows 8, you must alter some of the procedures in the test lab accordingly. Configure Client2: Client2 is a DHCP client computer. Start your computer using the Windows Server 2012 or Windows Server 2012 R2 product disc or other digital media. The previous step demonstrates the functionality in Windows Server 2012 or Windows Server 2012 R2 that enables you to search and run applications, settings, and files by clicking Start and then typing a search term. You can also open the Network Connections control panel by clicking next to Ethernet in Server Manager using the Local Server view. For more information, see Common Management Tasks and Navigation in Windows Server 2012 (http://go.microsoft.com/fwlink/p/?LinkId=242147). In Network Connections, right-click Ethernet and then click Properties. Click the Users folder, and then double-click user1 and then click the Member Of tab. Sign in to the computer using the user1 credentials. Click Other user and then type the user1 name and password. Next, create a DHCP scope on DHCP1. Click Next and then in Lease Duration under Limited to enter 0 Days, 0 Hours, and 2 Minutes. This very short lease duration will simplify the DHCP demonstration. In the DHCP console tree, right-click dhcp1.contoso.com, and then click Authorize. Type powershell and then under Results for “powershell” right-click Windows PowerShell and then click Pin to taskbar.Confirm that Windows PowerShell is pinned to the taskbar. Client1 can also be joined to the contoso.com domain; however this is not required to complete the test lab. Client2 is a computer running Windows 8 that is acting as a DHCP client. Configuration of Client2 is nearly identical to Client1. To configure Client2, repeat the identical procedures used to configure Client1, except when you enter a computer name, type Client2 instead of Client1. 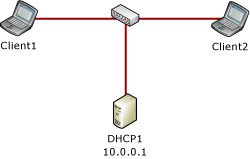 For the DHCP policy based assignment demonstration portion of the test lab, a MAC address based policy will be configured to assign unique DHCP options and IP address ranges to Client1 and Client2. Unique MAC addresses on Client1 and Client2 will be used to match different DHCP policies. 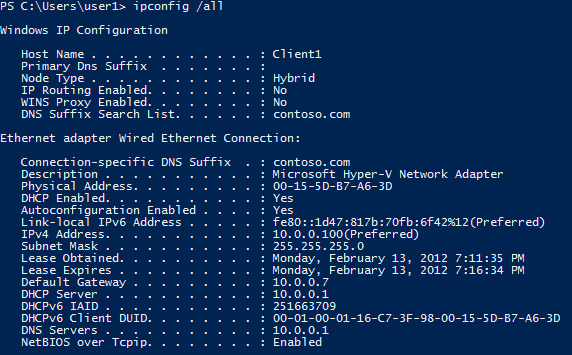 On DHCP1, open the DHCP console and navigate to IPv4\Scope [10.0.0.0] Contoso-scope1\Address Leases. Click Address Leases and then in the details pane write down the MAC addresses listed for Client1 and Client2 under Unique ID. The DHCP Policy Configuration Wizard will be used to create a unique policy for Client1 and another policy for Client2. A policy configured for an individual computer is not typical and is only configured for demonstration purposes. On a corporate network, you can use wildcards and other conditions to match multiple DHCP client devices. 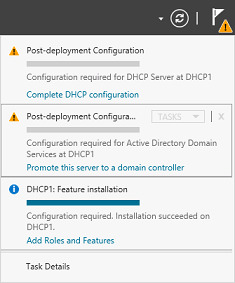 In the DHCP console, under Scope, right-click Policies and then click New Policy. Ensure that you select the Policy folder under the Scope folder. This is the scope-level folder. 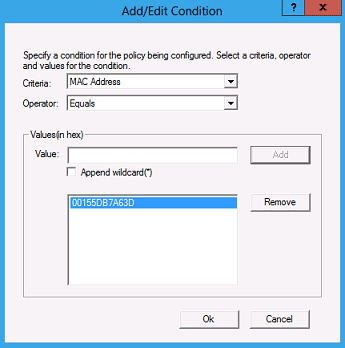 The other Policies folder is for server-level policies and if you create a policy there you will not be able to create the IP address range policy for this exercise. Next to Policy Name, type Client1 Policy, and then click Next. On the Configure Conditions for the policy page, click Add. In the Add/Edit Condition dialog box, choose MAC Address next to Criteria, type the MAC address for Client1 next to Value (001DB7A63D in this example), and then click Add, then click OK.
Click Next, and then in Configure settings for the policy, type 10.0.0.100 next to Start IP address and type 10.0.0.199 next to End IP address. Click Next, and then under Available Options, select 003 Router, type 10.0.0.7 under IP address, and click Add. Condition: MAC Address equals (in this example) 00155DB7A63E. Next, review the effect that these policies have on the IP address configuration of Client1 and Client2. In the details pane, under Policy Name, right-click one of the two policies you just created. Note that you can move the policy up or down in the processing order, delete the policy, or disable the policy. Review the available parameters that you can edit on the General, Conditions, IP Address Range, Options, and DNS tabs. 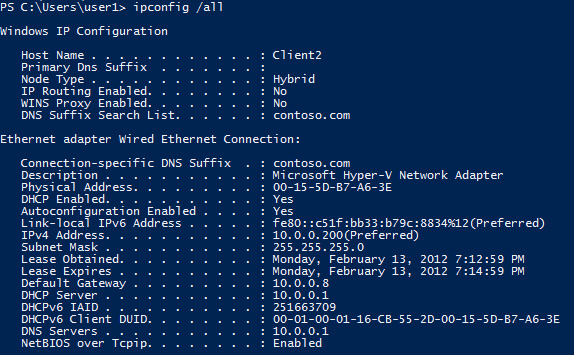 Click OK, and then on Client1 type ipconfig /all at the Windows PowerShell prompt. Client1 has been assigned the first IP address in the 10.0.0.100 – 10.0.0.199 range, and a default gateway of 10.0.0.7, as determined by the policy based assignment. If the IP address hasn't changed yet, you can type ipconfig /release and then ipconfig /renew to get a new lease. Repeat the previous step on Client2. Client2 has been assigned the first IP address in the 10.0.0.200 – 10.0.0.254 range, and a default gateway of 10.0.0.8. Policy based assignment in Windows Server 2012 or Windows Server 2012 R2 DHCP allows you to create simple yet powerful rules to administer DHCP on your network.